Can you please test Menta themes from this branch https://github.com/mate-desktop/mate-themes/commits/menta-backdrop ? I like to know if using the backdrop state is OK in general or maybe it is to overload and i have to reduce some settings. Hi, is it possible to add a gsettings key for this new feature? I am pretty sure we have users who don't like this. And i want to start with changing themes for backdrop state. So giving an user a chance to disable it would be really great. Yes, but it looks like this new feature created more problems than it solved... so maybe we should just revert it for 1.22. By "more problems" do we mean theme issues or bugs? Currently, we have a few reports by people who missed that feature. I didn't noticed any report against this feature. But every very little change which we did to help users can cause a report against it by another user. And using backdrop state isn't a little change. An example not related to this feature. For this reason i asked for a gsettings key to disable backdrop state. Sorry, that i asked you. Btw. the backdrop state is the only solution to sign a csd-window that it is in background. I can't remember how many reports were about this feature... today I only found this one: mate-desktop/mate-panel#749. Ok, I'll check how to add a new setting to Marco (seems like src/core/prefs.c needs some changes). Another report about missing backdrop state from firefox maintainer. Can you please check if it is possible to add a gsettings key for that feature? It's OK If you aren't able to do this, but please don't let me wait for this. Adding backdrop state to themes is a huge job and i can't do that from one day to another. 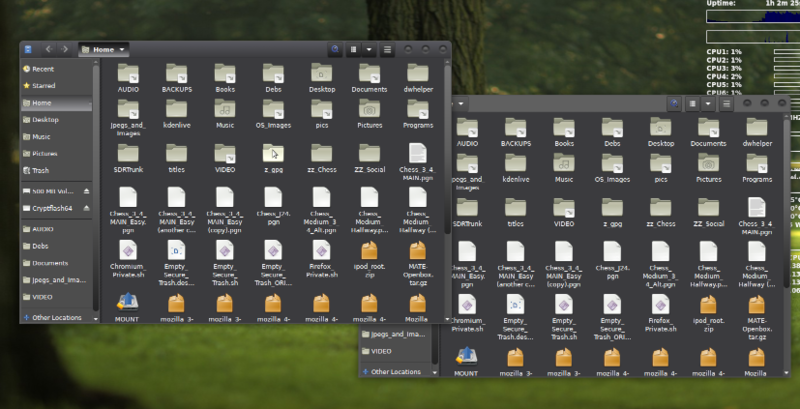 What I did in UbuntuStudio_Legacy was to only set a :backdrop theming different from the default theming for CSD window decorations and absolutely nothing else. That works, and makes CSD apps behave similiarly to traditional SSD apps so far as focus/backdrop appearance is concerned. While two empty gedit windows don't have a lot to theme, this does show the basics: same view colors, same backgrounds, etc, only the window decorations need to use :backdrop and set a different appearance. I know, but i like to style more widgets than the headerbar for Menta themes, similar what adwaita does. 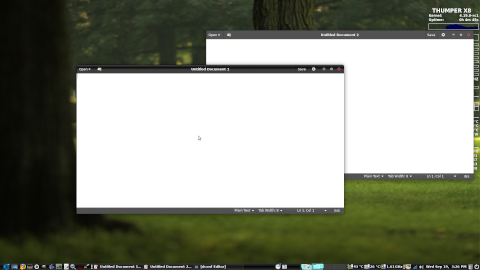 Here's Nautilus with BlackMATE, one window focused and one in backdrop. CSD code taken from UbuntuStudio_Legacy, mostly csd decorations and shadows are different(checked the code for instances of :backdrop). In most places the basic selector and same selector with :backdrop are simply listed together to keep them the same. Also note that :backdrop had to be used in BlackMATE and UbuntuStudio_Legacy to hide the carot in a non-selected view at one point, not sure if that is still the case though. Thank you , feel free to add what ever setting you want to BlackMate theme as maintainer of it ;). I did already a more extended setting to Menta themes since several months, see menta-backdrop branch. https://gitlab.com/lukefromdc/compiz/tree/dev-focus_WIP which is my branch of compiz-reloaded that supports _NET_WM_STATE_FOCUSED . It contains work by myself, @soreau, and @muktupavels to enable CSD focus and backdrop states. I use that branch as my daily window manager and it works well.